Together with designer and animator Klaas-Harm de Boer, we created the zoetrope Octomadness: a 3D-printed, hand-painted and custom-developed zoetrope. Klaas-Harm de Boer wanted to create highly flexible characters that could show the power and freedom of animation and 3D printing. 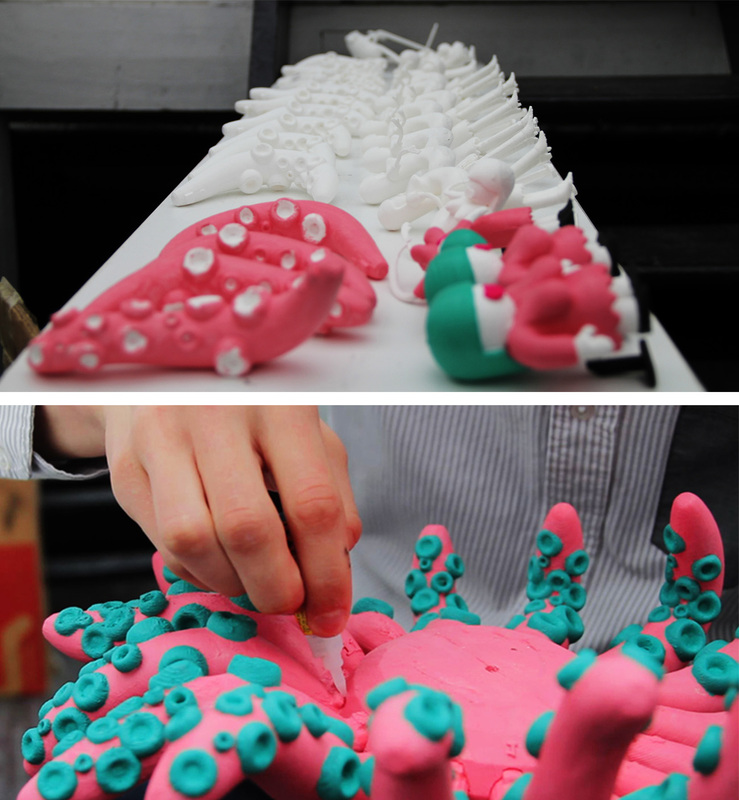 The zoetrope Octomadness combines 3D animation, 3D printing, each piece sawed, painted and glued together. It showcased at the KLIK animation festival in Amsterdam, where many visitors had never seen anything like it before. One of the earliest forms of animation is the zoetrope, a children’s toy that, like a flipbook, provided the illusion of motion. A series of images showing slight changes to the position of the subject is attached to the inside of a cylinder, which spins around on a plate. Peering through slits in the cylinder as it spins keeps the images from blurring together, creating an image that appears to be moving. Octomadness is made from 64 unique 3D-printed and hand-painted figures displayed on four tiers: On the top sits a single octopus with many more than eight tentacles, then there’s a skateboarding goldfish-like creature, then a woman with an expanding and contracting body, and finally there’s a long-legged grey creature. Each figure has been printed in 23 so-called frames of motion. We used an Arduino and custom circuitry to program and time the installation in such a way that all the elements are synced: the music, lights, strobe lighting and spinning of the plate. We currently have several new zoetropes in production, including one for a the Efteling one of the biggest theme parks in the Netherlands!